King Of The Aztecs is a game that tries to bring forward the South American civilization with this name, being themed around it. The theme is an OK choice, but there are a lot of competitors with the same topic, so the game better be great in order to stand out. It’s not though, the quality managing to be quite low and making the slot look like the Aztecs lived in the Stone Age. 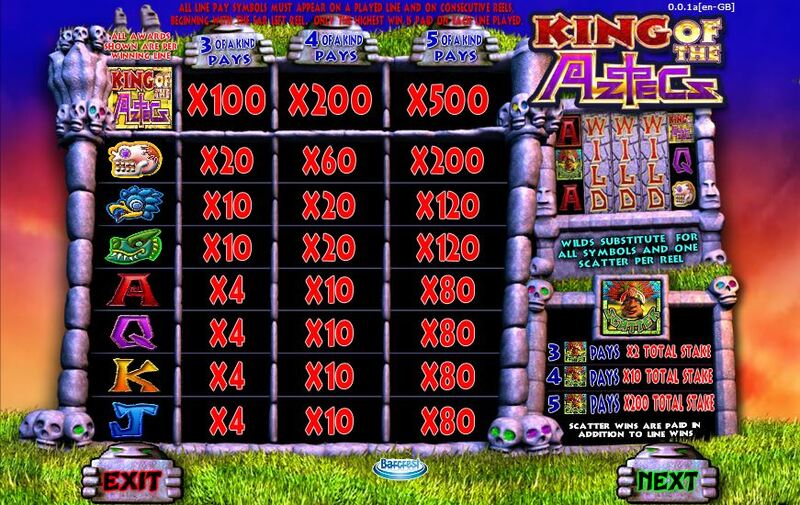 IGT is the developer behind this particular slot, but I’m not that impressed with what they managed to achieve here. 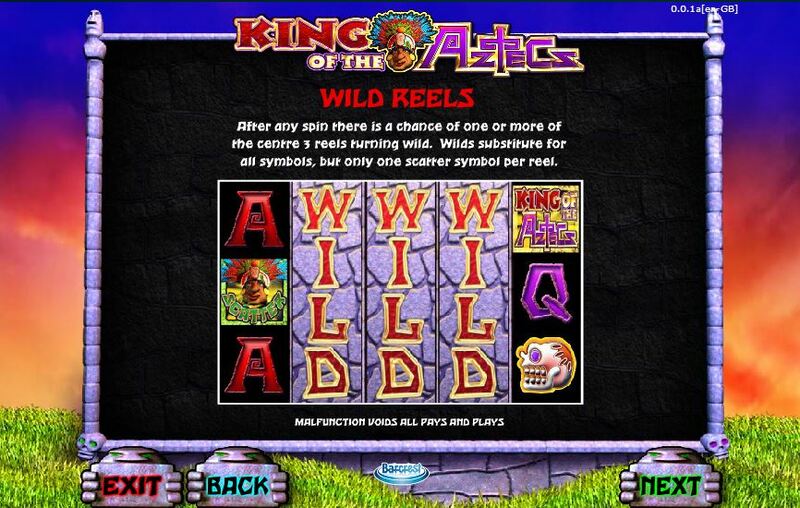 Despite the rather crude graphics, it can be a very rewarding slot machine, offering up to $80,000 cash and with scatters and wilds making the experience a bit more fun. The game has 5 reels & 20 bet lines. The features are rather weak, with scatters and wilds used, while the special part is the chance to get wild reels. The wild symbol appears on the three reels from the middle. 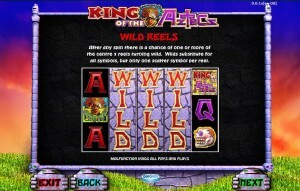 During each spin, you get a chance to turn 1 to 3 reels from the middle into wild reels. These wilds are capable of taking the place of any regular symbols, and since they take over entire reels you will find that you get paid quite often when they get involved. One wild reel counts as one scatter symbol, no more. As for the scatter, the image shown on it is that of the King of the Aztecs himself. This symbol can appear anywhere in the game, and you need a minimum of three in order to get a prize out of it. While in other slots it is used to start free spins or bonus games, here its only role is to give you a prize between 2x and 200x the total stake. You have two options to work with when you’re changing the value of a bet. You can modify the stake per line, between $0.05 and $20, and you can also change the number of lines (1 to 20). The maximum bet is worth $400. 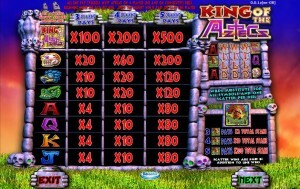 Regular combinations of symbols will pay 500 times the line bet, so up to $10,000 at the most. The scatter symbol does a lot better though, giving away up to 200x the total stake, meaning as much as $80,000. I feel like the design is by far the slot’s weakest part, though the features aren’t impressive either. With a lot of stone and with low resolution images used everywhere, it feels like a slot that would’ve been popular a decade ago, but definitely not a modern title. There is nothing impressive about this game, and even though the playing cards are drawn to look like they are inspired by Aztecs, the overall quality is the same, meaning very low. 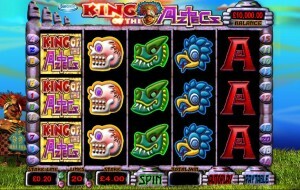 Symbols: Aztec Chief (scatter, 200x total bet), Game Logo (500x), Skull (200x), Bird (120x), Crocodile (120x), Ace (80x), King (80x), Queen (80x) and Jack (80x). With so many great options available these days, I find it hard to recommend it, even though I did enjoy the wild reels that appear in the middle of the game area. The graphics are pretty bad though, so if you want something modern, this isn’t it. This King Of The Aztecs slot is offered by all online casinos with IGT software, playable either in practice or in real money mode.